I’m back today with a digi-image from Tiddly Inks. This is Annie and she’s been stamping. 🙂 The card on the image is actually blank so you can fill in whatever you’d like. I stamped the flower and “hi,” drew in the little stem and added the mini brad to the flower center. 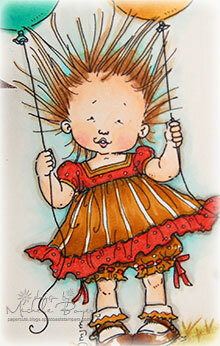 Digi-image: Tiddly Inks “Annie’s Card” and Cornish Heritage Farms “Tag! You’re In!” Ink: Memento Tuxedo Black Cardstock: Bazzill; Papertrey Ink White Patterned Paper: October Afternoon Ducks in a Row 8×8 paper pad Accessories: Copic markers (E000, E00, Y21, R81, R83, YG03), Prismacolor pencils, Spare Parts trim by Paper Studio, May Arts ribbon, Michael’s mini-brad. Finished size 4 ¼” x 5 ½”. I needed a birthday card for my “young teen” nephew and thought Christy‘s U Rock digi-image (from Tiddly Inks) might be perfect. 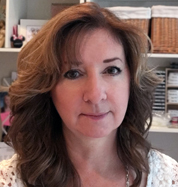 If you haven’t checked out Christy’s digi-shop, you must. CUTE stuff there! After printing and coloring my image, I ran the paper back through my printer to print the “dude” in the corner. (It was a little scary but turned out ok.) The font, from Scrap N’ Fonts, is called SNF Goody (designed by my sweet friend, Kim Hughes). I’ll be back soon! Thanks so much for stopping by! Have a great day! 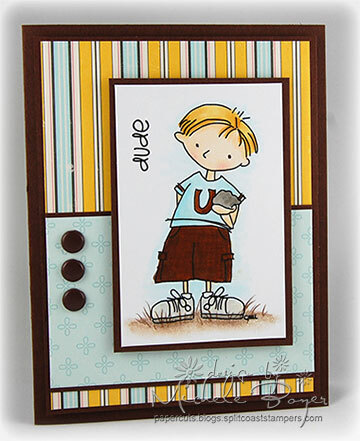 Digi Image: Tiddly Inks “U Rock” Font: SNF Goody (Scrap n’ Fonts) Cardstock: Papertrey Ink Dark Chocolate, Stampers Select Patterned Paper: October Afternoon Ducks in a Row 8×8 paper pad Accessories: Copic markers (E50, E51, E57, R20, B000, B01, Y21, C1, C3), Prismacolor pencils, brads, dimensional boosters. Finished size 4 ¼” x 5 ½”. I love this little girl…that curly hair…her sweet face. She’s my favorite. 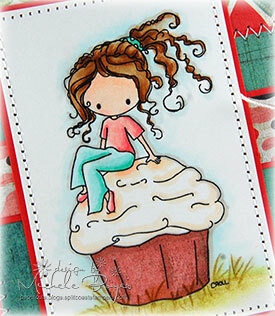 She’s a Curly Q.
I printed her onto a white Perfect Paper Panel (by My Favorite Things), colored her with markers and then paper-pieced the cupcake liner using a solid-“ish” paper from Basic Grey’s new Olivia paper pad. The sentiment is from Christy’s Handwritten Sentiments which I also printed onto another solid-“ish” paper from the pack. 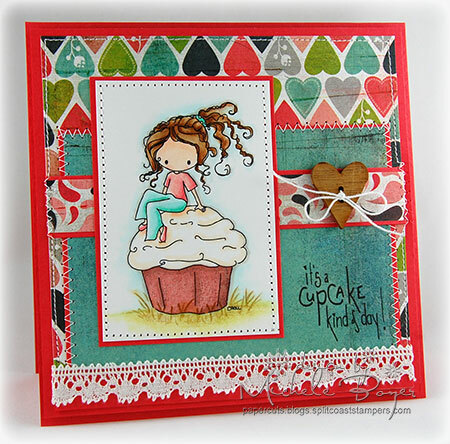 Digi-images: Tiddly Inks “Cheery Q” and “Handwritten Sentiments” Cardstock: Prism Blush Red Medium, MFT white Perfect Paper Panel Patterned Paper: Basic Grey Olivia 6×6 paper pad Accessories: Copic markers (E000, E00, E31, E33, E35, E50, E51, E57, BG0000, BG23, R00, R32, W00, W1), Prismacolor pencils, trim, Favorite Findings wooden heart button/white string, sewing machine, dimensional boosters. Finished size 5 ½” x 5 ½”. This one is called “End of Summer.” So carefree. So sweet. Kind of reminds me of my daughter. She was fun to color. As always, I used mostly markers with a bit of pencil on the ground. Digital Image: Mo’s Digital Pencil “End of Summer” Sentiment: Cornish Heritage Farms “Silhouette Blooms I” Ink: Memento Tuxedo Black Cardstock: Stampin’ Up Always Artichoke, Papertrey Ink Vintage Cream Patterned Paper: Basic Grey Green at Heart 6×6 paper pad Accessories: Copic markers (E000, E00, E31, E33, E35, R20, R11, YG91, YG93, YG95, YR04, YR07, V12, V15, V17, C00, C1, Y0000), Spare Parts trim, Flora Doodles foam flowers, brads, clear embossing powder (over sentiment), dimensional boosters. Finished size 5 ½” x 5 ½”. 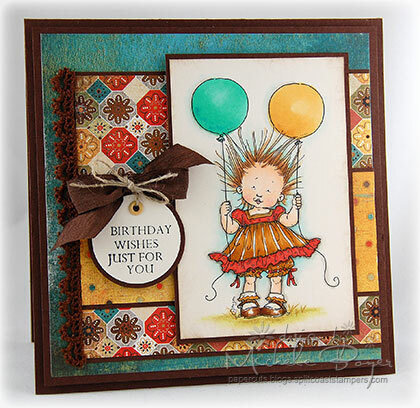 Digi-image: Mo Manning “Angelina’s Balloon” Sentiment: Cornish Heritage Farms “Classic Essential Expressions” Ink: Memento Tuxedo Black Cardstock: Papertrey Ink Dark Chocolate, Vintage Cream Patterned Paper: Basic Grey Max & Whiskers 6×6 paper pad Accessories: Copic markers (E000, E00, E33, E35, E37, E50, YR23, YR24, R05, R20, BG0000, BG01, BG34, BG49, YR31, W1, W3), Prismacolor pencils, ribbon and trim, Bow Easy, eyelet, linen thread, 1 ¼” and 1 3/8” circle punches, dimensional boosters. Finished size 5 ¼” x 5 ¼”. Inside the shaker, I used Twinklets Diamond Dust which is made of finely ground glass. (My friend, Jody, made me buy it a couple years ago.) It’s super sparkly and what I like most is that it doesn’t look plasticy like some “snow-ish” products. I cut all the pieces of the shaker (including the acetate) using my oval Nestabilities. A thin strip of dimensional foam tape (cut to about 1/8″ width) is sandwiched between the layers to hold the ‘snow’ inside. 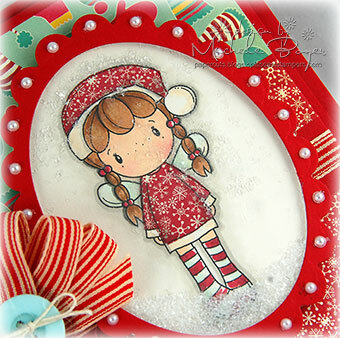 Digi-image: All That Scraps “Santa Birgitta” Sentiment: Cornish Heritage Farms “Heart Warmers” (Kim Hughes Collection) Cardstock: Stampin’ Up Real Red, Papertrey Ink Vintage Cream Patterned Paper: Cosmo Jolly by Golly Accessories: Copic markers (E000, E00, E31, E33, E35, E50, R37, R59, G0000, W00, W1, W3), ribbon, button, cream jute string, Twinklets Diamond Dust, Memory Box pearl stickers, Spellbinders Nestabilities, acetate, dimensional foam tape, clear embossing powder, dimensional boosters. Finished size 5 ½” x 5 ½”. Today My Favorite Things is previewing Truffles Flopsey, Love Machine and introducing four new robot digi-images. I’ve used one of the four new robot images here. Aren’t they a cute couple? The sentiment is from the Love Machine set, previously released as part of an MFT kit but soon to be available (Wednesday, 12/2) on its own. To see more previews, be sure to check out Kim’s blog here (after 11 a.m. EST). Digi-Image: MFT “Robot 2” Stamp (sentiment): MFT “Love Machine” Ink: Memento Tuxedo Black Cardstock: Stampin’ Up Night of Navy, Prism Super Smooth White Patterned Paper: Bella Blvd. Honey I’m Home “Alleyway” and “Couch Potato” Accessories: Copic markers (B000, B00, YG91, YG93, YG95, Y17, Y38,R05, YR0000, Y0000, C00, C1), Prismacolor pencils/turpenoid, Inkssentials white opaque pen, Recollections mini brads, MFT dotted ribbon, Spellbinders Nestabilities, Fiskars Apron Strings border punch. Finished size 5” x 5”. This is Heidi among the Flowers from the Swiss Pixie collection. I think they’re all so cute. I may need another! Digi-image: C.C. 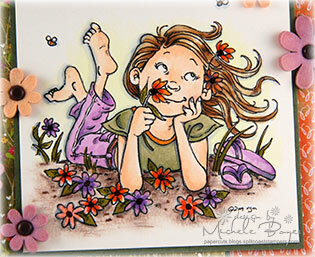 Designs “Heidi among the Flowers” Stamp: Cornish Heritage Farms “Tag! 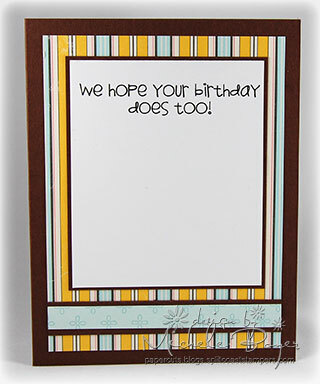 You’re It!” (Kim Hughes Collection) Ink: Memento Tuxedo Black Cardstock: Prism Suede Brown Dark, Super Smooth White Patterned Paper: Cosmo Cricket Earth Love” Accessories: Copic markers (E000, E00, R20, E31, E33, YR23, YG06, R14, R17, Y0000, W00, W1, W3), felt flower by We R Memory Keepers, SU button, Papertrey Ink cream jute string, Spare Parts by Paper Studio crocheted trim. Finished size 5” x 5”. Isn’t she cute holding that big ol’ pumpkin? 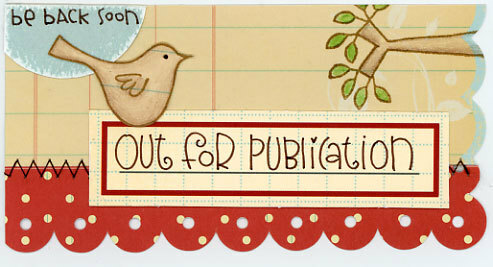 Today is the last day to get 25% off at the Paper Crafts/CK Online Store. Use code ENVN-6FNC-HPYG at checkout! Digi image: Digi Stamp Characters Stamp: Cornish Heritage Farms “Let’s Get Stuffed” (Kim Hughes Collection) Ink: Memento Tuxedo Black Cardstock: Prism Suede Brown Dark, Papertrey Ink white Patterned Paper: Basic Grey Indian Summer paper pad Accessories: Copic markers (E000, E00, R20, E33, E35, E57, YR0000, YR20, YR23, W00, W1), button, cream jute string. Finished size 5” x 5”.